Peru is home to more archaeological sites than any other country in South America. However, with mangroves, cloud forest, oases in the desert and glacial lakes, it is also a country of incredible natural diversity. 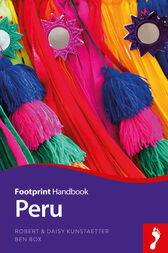 Footprint’s 9th edition Peru Handbook will guide you from spectacular and spiritual fiestas to the awe-inspiring sights of the Sacred Valley. From uncovering the best gourmet spots in Lima to the sapphire shores of Lake Titicaca, Footprint’s fully updated 9th edition will help you navigate this incredible destination.